Made from the finest blend of slow burning, smooth tasting tobaccos. 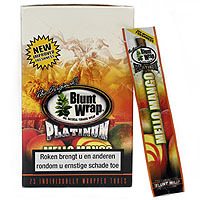 The Platinum Blunt wraps are by far the most fragrant blunts we’ve seen! Each blunt is individually packaged and sealed to ensure freshness. This product was added to our catalog on Tuesday 27 November, 2007.